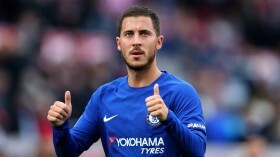 Belgium international Eden Hazard is prepared to remain with Chelsea for the rest of the season before pursuing a big-money challenge to Real Madrid in the summer. Hazard has harboured the ambition of playing for Los Blancos since his Lille days and over the past few years, he has regularly flirted with the idea of joining the European champions. According to Marca, Hazard remains keen on joining the Spanish heavyweights but he won't push through a mid-season move away from the FA Cup holders. The report adds that Los Blancos are comfortable waiting for the attacker until the summer, given they don't want to spoil their association with the Blues. Hazard has contributed 10 goals and as many assists in the Premier League this term but he was largely disappointing during the recent 2-0 derby defeat to Arsenal where he was barely a threat from the false nine position. The Belgian attacker currently has less than 18 months remaining on his deal.